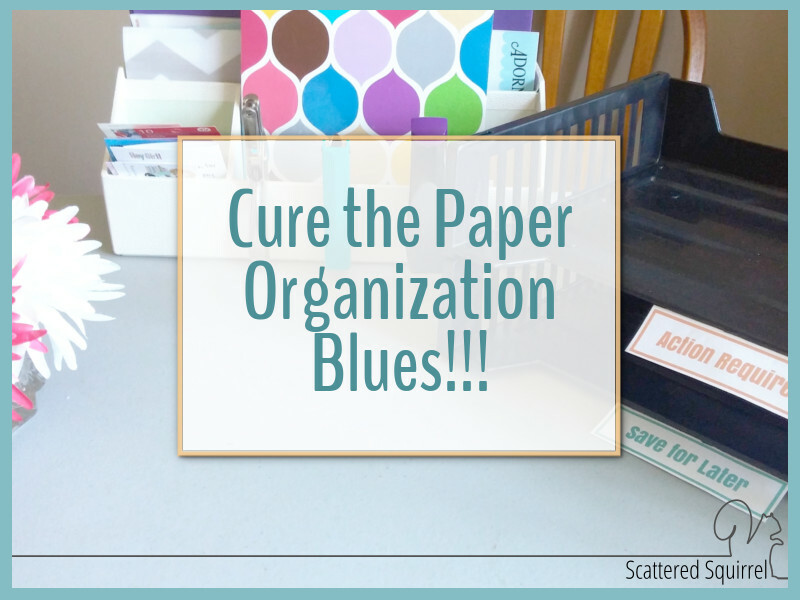 Cure the Paper Organization Blues Once and For All! Everything was going so well. I had a wonderful system in place that was working for us and for almost a whole glorious year we had no paper clutter. No. Paper. Clutter. Then something happened to disrupt my paper organization success and suddenly I’m drowning in papers again! Where do they all come from? I swear they multiply overnight. I’m pretty sure the stack on my desk was not that large last night. The school work sitting on the downstairs table was only one stack – I’m almost positive of that. And where did that pile of mail on the entry way table come from? I admit it, I feel defeated by the paper. Overwhelmed by it all and generally just wiped out at the thought of having to wade through it all. I know I’m not the only one who struggles with how to deal with paper clutter. Coming up with the right system to handle the influx of the papers that make up our daily lives can be a frustrating process. I think a large part of it is that it’s not something we can totally control. 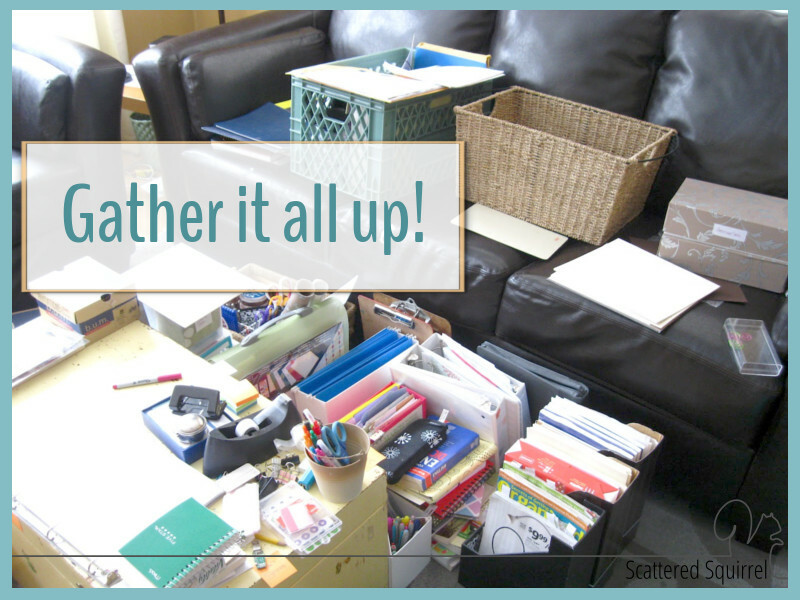 When it comes to decluttering and organizing other items and spaces we have more control during the process. If we’re decluttering our kitchen we can make the conscious choice not to purchase more kitchen items until we’re finished. Sorting clothes, same thing. But when it comes to paper organization we cannot simply say “No thanks” to all the papers that come into our home. So how do we create a system that will work for us? I had paper peace once, and I’m determined to get it back again! Last year I handed back the breakfast nook space to my family and moved my office upstairs in an attempt to create a little more separation from work and home life. It wasn’t really a big decision, but it’s had a number of ripple effects on the home that I didn’t foresee. The build up of paper clutter is just the latest example of how much I used my office for home life as well as work. There are many reasons that paper clutter builds up in our homes. Most often it’s simply that we don’t have a system in place to deal with them. Or maybe we have a system, but it’s no longer working for us. Identifying the cause of the problem can help us create a plan that works with or even eliminates the cause. Like all organizing projects, dealing with our paper clutter is going to take some time. I’m giving myself a few weeks to declutter, streamline, and create a system that will work for my family moving forwards. I’ve given a lot of thought towards how to approach this because I’m dreading it. Don’t get me wrong, I love a good organizing project, but papers are my least favourite task to tackle. I’m sure a professional organizer would have a better approach, but I’m not a professional. I’m just a person who is looking to create systems that work for her, even if they make no sense to anyone else. Knowing myself like I do, I know that the typical approach to organizing isn’t going to work for this project. I simply cannot start with the decluttering step. Instead, I’ve come up with a plan that I think will help make the process easier in the long run, even if some steps seem a little backward. This is a crucial step because it will have an impact on how you approach the rest of this challenge. You just need to ask yourself one question – are you a piler or filer? stack their papers in piles. Sometimes they are neat piles. Sometimes they are not. are most comfortable with the sort, drop, and go approach to paper organization. know where things are within their piles. don’t hate filing, it’s just not natural for them. The downside to this style of paper organizing is that sometimes things get forgotten or lost for a time. Knowing the downsides to being a piler can help you create a system to minimize those things. keep their papers neat and organized in various different files. often don’t like to leave piles of paper sitting out for too long, if you’re a filer with a lot of piles, chances are you just haven’t come across the right system for you. though everyone needs to file away some papers stuff, filers prefer to file it all – many will have action files that get emptied as items in them are dealt with. The downside to this system is that sometimes the filing system itself can become cumbersome and it’s easier to hold onto papers they don’t need to keep. Out of sight is out of mind. Again, knowing the downside can help to create a system to keep control of the paper clutter, by maybe setting aside time twice a year to purge the files. Determining which category you fall into is fairly easy. Think about how you work best at home. If you have piles of paper, whether in actual piles on a flat surface, or in paper trays, on shelves, in magazine holders etc… and you’re comfortable working with those; you know where everything is and it’s easier for you to process items in a pile than hunt for them in files, chances are good that you’re a piler. It’s a total myth that pilers are not organized, their organizing system is just a little different than that of filers. If you work best by having everything categorized and sub-categorized you might be a filer. Filers don’t always use files, but they do tend to be a little more particular about how they store and access their papers. They might use paper trays and magazine holders just like pilers, but they tend to assign a task, topic, or category to each one. One of the key differences (at least through my personal observations) is that filers are more likely to naturally put papers back after they’ve been used. If they pull out a file to pay a bill or look up some information, they are more likely to put the paper or file back where they found it right away. A piler is more likely to place it in a pile to be dealt with later. Knowing which category you lean to is going to help in step 3. My old drop zone! 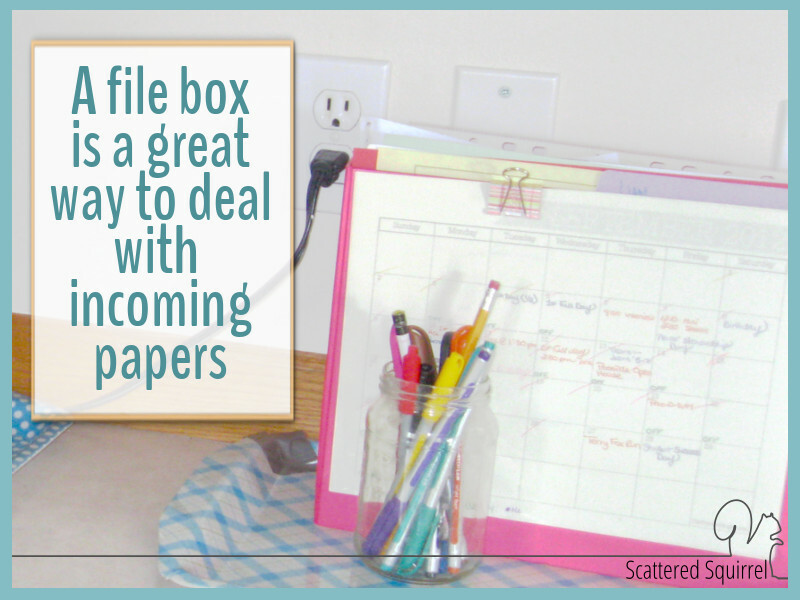 File boxes are great – especially if you’re a natural filer. Take a quick peek around your home. Where does paper tend to accumulate? Every home has these paper magnets to one degree or another. My three paper hotspots are the breakfast nook table, the entry way table and my office. What kind of papers are finding their way to these homes? Is there a theme to them? Take a few minutes to make a note or two about these hot spots and what’s accumulating in them. I have a hot spot tracker printable if you’d like to use it. It will help when we get to the next step. If you don’t have them, then you know you’ve created a good system for handling incoming papers. And you can probably skip the next few steps. Labeled paper trays on my desk to help organize incoming papers. I mentioned this above, unlike other organizing projects, we can’t keep more paper from coming into our homes. We can try to limit it as best we can, we won’t be able to totally eliminate it. Having a plan to deal with incoming paper means we don’t have to worry about adding to the decluttering job. This is where knowing your paper organizing style will come in handy because we want to create a system that will be easy for us to use. Like I always say, create a system that works for you, not the other way around. The last category is the easiest to plan for. Keep a recycle bin or a to be shredded bin near where you typically sort your papers. The other two categories take a little thinking about. This is where it will help to know what your natural paper organization style is. I’m a natural piler and I prefer to keep my systems simple because for me they’re easier to deal with that way. My plan is to use two baskets in each of my hot spots. One for File/Keep items and one for Act/Respond items. That way I can quickly sort incoming papers as they come in, and make a plan to deal with the action items a few times a week. The File/Keep items can wait a little longer. If you’re a natural piler, consider using a simple drop and go system that is easy to use. Whether you use baskets, mail sorter, magazine holders, it doesn’t really matter. Just make sure you create categories (even if you go very broad like I am) so you have a good idea of what is what. If you’re a natural filer you might want a system that offers a little more structure. A small file box on your table with folders for certain things might be an excellent option for you. Or perhaps a magazine holder or mail sorter combined with folders or dividers to offer you some more options. An old picture, but still how I organize paper clutter to be sorted. You knew this step had to come right? It’s the step I’m dreading most, but it must be done. It’s time to gather up all the paper clutter from around the home. You can approach this however you like. I’m trying to minimize the amount of work I’ll need to do later, so I’ve created a mini system for gathering the papers. Start at each hot spot that you identified in step 2. Sort the papers as you collect them. Toss the junk and stick the act/respond items into the appropriate bin or holder. The File/Keep papers can either go into one basket or a few baskets. For me I’m using three one for work, one for house stuff, and one for family stuff. This way part of the sorting is already done for me, and I can enlist help when I get to the family bin because most of the items in there will not be mine. Work my way around the home gathering up any other papers that might not have been in the hotspots. Place the basket or baskets in the area where you will sort the papers. By taking the few extra minute to separate the junk and action items before doing the bulk of the sorting we’ve cut down on how much time we’ll have to spend sorting the papers out later, which means we can really zero in on what to keep and start thinking about how we’re going to store them. This concludes part one of the challenge. Don’t worry about those baskets just yet – we’ll get to those next week. 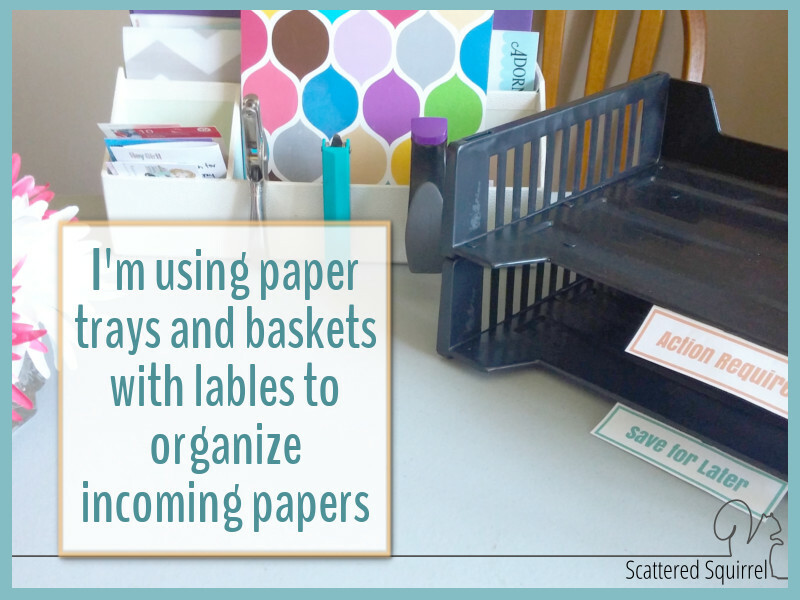 For right now, just focus on identifying your paper organization style, your homes paper hotspots and creating a plan for dealing with incoming papers. 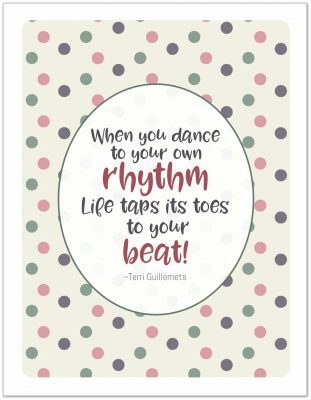 Small steps give us time to think and not rush into things. 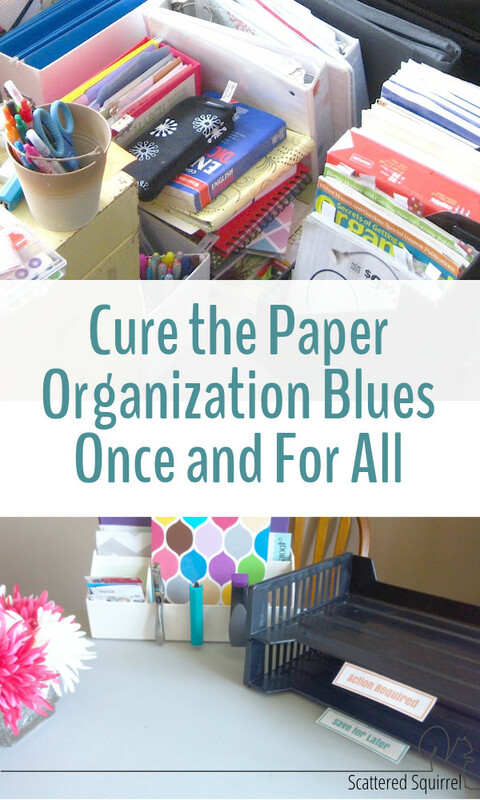 The goal with this challenge is to create a system that will work us and our families so that we can finally say so long to the paper organization blues. Now it’s your turn – do you have any tips and tricks that work well for you when it comes to beating paper clutter in your home? Anything you’ve tried that did not work? We’d love to hear your thoughts. My problem is I have YEARS of papers, all over. I’m probably more of a piler so a lot of stuff ends up in boxes, in drawers, in plastic totes. I try to keep the dated stuff near me but beyond that, it just kind of ends up all over. I’m a paper hoarder! You are not alone Janeen. I’m a paper hoarder too, though I’m getting a little better with it each pass I do through our papers. Over the next couple of weeks I’m going to be sharing my tips for sorting papers and some ideas for different storage options and systems, I’m hoping to be able to really get a handle on our papers. Thank you! Never realised I was a piler and always just felt so ashamed of the fact that I could not get my head around the filing bit. What I did know was that, as soon as something was out of sight, I would forget about it, and therefore never wanted to put something away ‘completely’. Looking forward to reading the rest! Hi Susan, I’m a piler too 🙂 It can be very frustrating trying to figure out why the filing bit never works well for us. I used to try to make myself into a filer and it was nothing but it was always an exercise in futility. One of the things that really help me was just not using files for papers that don’t need to be kept long term. It makes it so much easier when I don’t have to deal with filing things on a regular basis. I’m hoping to get the next post ready for tomorrow!